This article was written in collaboration with Simpson StrongTie. All bolts and other materials are proprietary to them. The catalog used has since been superseded, though the values have not changed much. For wood frame retofit work, Simpson makes a number of different foundation bolts that can be used. 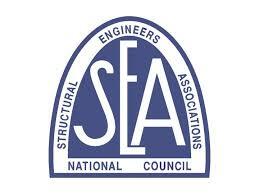 This information will only be of interest to engineers and contractors. Page 108 of Simpson Catalog C-SAS-2005 rates their 1/2 inch wedge anchors in 2000 psi concrete with a 5 inch concrete edge distance at 1675 pounds in shear (The minimum embedment for this installation is 4 1/2″). Factoring in the Simpson allowed 1.33 short term loading adjustment factor; the bolts are worth 2,227 pounds in shear. If the bolts are put through the center of the 2 by 4 blocks as shown on the plan set we end up with a 2 1/4 concrete edge distance. Interpolating from the load adjustment factor table dealing with concrete edge distances on page 113 we have a load adjustment factor of .725. The ½ inch wedge anchor can therefore resist of 1650 pounds of shear in the concrete. The strength of the wood to bolt is 1119 pounds per the 2005 NDS. The failure mode here will obviously be in the wood-to-bolt connection, not in the concrete. It is therefore rational for us to endorse use of the ½ inch wedge anchor. The adjustment factor table on page 113 in Simpson Catalog C-SAS-2005 catalog does not recognize a value for 5/8 wedge anchors with concrete edge distances less than 2-1/2 inches. We only have 2-1/4 inches edge distance if the wedge anchor is put through the center of the 2×4 block as shown in the Plan Set. It is not rational for us to endorse the use of the 5/8 inch wedge anchor. The Simpson catalog on page 51 gives us a value of 2,820 pounds of shear for a 1/2 inch bolt using ET epoxy with a 6 3/8 inch concrete edge distance (embedded 4-1/4″). Factoring in the Simpson allowed 1.33 short term loading adjustment factor allowed by the Simpson catalog allows us 3,760 pounds of shear. If the bolts are put through the center of the blocks as shown on the plan set we end up with a 2 1/4 concrete edge distance. Interpolating from the load adjustment factor table dealing with concrete edge distances on page 55 we have a load adjustment factor of .28 so that our epoxy bolt can now resist 1053 pounds of shear. The strength of the wood to bolt connection in 2” closed grain redwood is 1119 pounds per the 2005 NDS The failure mode therefore will be in the concrete and not in the wood. It is therfore not rational for us to endorse use of the ½-inch ET epoxy bolt. A 5/8 inch epoxy bolt installed with ET epoxy and a 7 1/2 inch concrete edge distance has a shear value of 4890 pounds as shown on page 51 (embedded 5″). Multiply this by 1.33 short term loading adjustment factor as allowed by the Simpson catalog and we get a value of 6520 pounds. If the bolts are put through the center of the blocks as shown on the plan set we end up with a 2 1/4 concrete edge distance. Interpolating from the load adjustment factor table dealing with concrete edge distances on page 55 we have a load adjustment factor of .205 so that our epoxy bolt can now resist 1336 pounds of shear. The strength of the wood to bolt connection in 2” closed grain redwood is 1555 pounds per the 2005 NDS. The failure mode here will be in the wood to bolt connection not in the concrete. It therefore not rational to endorse use of the 5/8-inch ET epoxy bolt. A 1/2 inch epoxy bolt installed with SET epoxy at 1-3/4 inch concrete edge distance has a shear value of 2125 pounds as shown on page 38 (embedded 4-1/4″). Note these loads are tested at 1-3/4” with shear parallel to the edge of the concrete, so no reduction factors need to be applied. Multiply this by the 1.33 short term loading adjustment factor as allowed by the Simpson catalog and we get a value of 2833 pounds. The strength of the wood to bolt connection in 2” closed grain redwood is 1119 pounds per the 2005 NDS. The failure mode then will be in the wood to bolt connection and not in the concrete. It therefore rational to endorse use of the ½-inch SET epoxy bolt. A 5/8 inch epoxy bolt installed with SET epoxy at 1-3/4 inch concrete edge distance has a shear value of 2215 pounds as shown on page 38 (embedded 5″). Note these loads are tested at 1-3/4” with shear parallel to the edge of the concrete, so no reduction factors need to be applied. In fact, loads will be higher than specified for our condition of 2-1/4” edge distance. Multiply this by the 1.33 short term loading adjustment factor allowed by the Simpson catalog, and we get a value of 2953 pounds. The strength of the wood to bolt connection in 2” closed grain redwood is 1555 pounds per the 2005 NDS. The failure mode then will be in the wood to bolt connection and not in the concrete. It therefore rational to endorse use of the 5/8-inch ET epoxy bolt. A 1/2 inch Titen HD screw anchor installed at 1-3/4 inch concrete edge distance has a shear value of 1165 pounds as shown in the table at the top of page 99. The minimum embedment depth is 2-3/4 inches. This accounts for a 6 ½ Titen Hd that goes thru the ¼ inch plate washer, the nominal 2x block, and through the full dimensioned 2x sill. In this case we get an embedment depth of exactly 2 ¾ inches. Note these loads are tested at 1-3/4” with shear parallel to the edge of the concrete so no reduction factors need to be applied. In fact, loads will again be higher than specified for our condition of 2-1/4” edge distance. Multiply 1165 lbs by the 1.33 short term loading adjustment factor as allowed by the Simpson catalog and we get a value of 1549 pounds. This value will go up to 2274 pounds if we use an 8 inch Titen HD 1/2-inch Titen HD concrete screw. The strength of the wood to bolt connection in 2” closed grain redwood is 1119 pounds per the 2005 NDS. The failure mode then will be in the wood to bolt connection and not in the concrete. It therefore rational to endorse use of the ½-Titen HD. A 5/8 inch Titen HD screw anchor installed with a 1-3/4 inch concrete edge distance has a shear value of 1205 pounds as shown in the table at the top of page 99 of the catalog. The minimum embedment depth is 2-3/4” . This accounts for a 6 ½ Titen Hd that goes the ¼ inch plate washer, the nominal 2x block, and through the full dimensioned 2x sill. In this case we get an embedment depth of exactly 2 ¾ inches. Note these loads are tested at 1-3/4” with shear parallel to the edge of the concrete so no reduction factors need to be applied. Multiply 1205 pounds by the 1.33 short term loading adjustment factor as allowed by the Simpson catalog and we get a value of 1602 pounds. This value will go up to 2347 pounds if we use an 8 inch Titen HD. 5/8-inch Titen HD concrete screw. The strength of the wood to bolt connection in 2” closed grain redwood is 1555 pounds per the 2005 NDS. The failure mode then will be in the wood to bolt connection and not in the concrete. It therefore rational to endorse use of the 5/8-inch ET epoxy bolt. The primary expense in any retrofit is the cost of the labor. Drilling the hole through the block and sill and into the concrete. Tightening the bolt with an impact wrench or right angle drill. Drilling the hole through the block and sill into the concrete. Driving the bolt into the hole with a hammer. Tightening the bolt by hand with an impact wrench or with an angle drill. The amount of labor is practically the same as for the Titen HD. Once the reduced cost of the Wedge-All is factored in, this is the preferred choice for the ½ inch bolt. Blowing out the hole with compressed air. Injecting epoxy into the hole. Coming back hours later and tightening the bolt. Given strength provided versus the material and labor costs for the hardware mentioned above, the bolt hardware can be ranked from the most preferred to the least preferred as follows in terms of overall cost. All these bolts are suitable in seismic retrofit applications. The 5/8-inch Wedge-All retrofit bolt is not permitted by Simpson Strong-Tie because it is not possible to meet edge distance requirements.